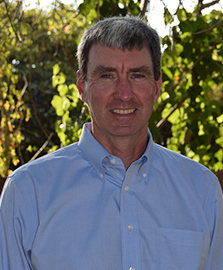 Dr. Chris Surfleet is a Cal Poly graduate in Forestry and Natural Resources, with a Master of Science and PhD in Forest Hydrology from Oregon State University. He has considerable experience in watershed management and research. His career as a hydrologist has spanned academic, research, private land management, and federal forest land management. His research has emphasized the hydrologic, soil erosion, and water quality effects of land management activities as well as hydrologic responses to climate change. 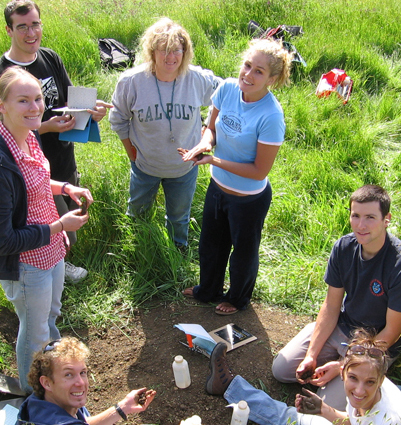 Currently Dr. Surfleet and Cal Poly students are studying the hydrologic response of meadow restoration and hydrologic and water quality effects from forest practices at the Caspar Creek watershed. Dr. Surfleet is very helpful and engaging. He consistently tries to involve the class with activities from lecture material that are generally helpful. For a newly structured class, he did a wonderful job teaching it. Dr. Surfleet has fun and interesting activities. This was the first time in my 5 years of collegiate studies that I have been asked to make a movie. And not just any video, but one that directly pertains to my research work. This was one of the most fun projects I have had the pleasure of working on and I am very grateful that Dr. Surfleet was involved in this class for that reason. I also learned a lot about the publishing world and about my own personality type. He has interesting and beneficial assignments, not just fluff work, which benefits me as a grad student. Dr. Surfleet is an all-around good guy. I can tell he genuinely likes his job and cares about the students he teaches. He has the student's general interests at heart and is very understanding and willing to understand our points of views. He has helpful assignments and even more helpful feedback. He really encourages me as a student, rather than put me down as I have seen other teachers do. This kind of teaching makes me want to go on and pursue a PhD- that's one of the greatest gifts a teacher could give their students. Professor Surfleet is an awesome teacher and he really knows what he is talking about ! He is an inspirational professor and really allows his students to enjoy the work we do in class. Surfleet, C., Sanford, T., VanOosbree, V. and J. Jasbinsek. In review. Hydrologic response of a meadow following restoration by removal of encroached conifers. Submitted to Water, January 4, 2019. Louen, J. and C. Surfleet. 2017. Hydrologic influences on stream temperatures in Little Creek and Scotts Creek, Santa Cruz County, California. In: Standiford, Richard B.; Valachovic, Yana, tech cords. Coast redwood science symposium—2016: Past successes and future direction. Proceedings of a workshop. Gen. Tech. Rep. PSW-GTR-258. Albany, CA: U.S. Department of Agriculture, Forest Service, Pacific Southwest Research Station. 131-134. Surfleet, C., A. Skaugset, and B. Dietterick. 2012. An Approach to Study the Effect of Harvest and Wildfire on Watershed Hydrology and Sediment Yield in a Coast Redwood Forest. In: Standiford, Richard B.; Weller, Theodore J.; Piirto, Douglas D.; Stuart, John D, technical coordinators. Proceedings of coast redwood forests in a changing California: A symposium for scientists and managers. Gen. Tech. Rep. PSW-GTR-238. Albany, CA: Pacific Southwest Research Station, Forest Service, U.S. Department of Agriculture. 675 p.
Skaugset, A., Surfleet, C., Dietterick B. and A. Simmons. 2011. The Effect of Selective Harvest on Watershed Hydrology and Sediment Yield in a Coast Redwood Forest. In: Standiford, Richard B.; Weller, Theodore J.; Piirto, Douglas D.; Stuart, John D, technical coordinators. Proceedings of coast redwood forests in a changing California: A symposium for scientists and managers. Gen. Tech. Rep. PSW-GTR-238. Albany, CA: Pacific Southwest Research Station, Forest Service, U.S. Department of Agriculture. 675 p.
Surfleet, C., and D. Tullos. 2012. Uncertainty assessment of hydrologic response to climate change for the Santiam River, Oregon. Hydrologic Processes, DOI: 10.1002/hyp.9485, 16 p.
Surfleet, C., Tullos, D., Chang,H., and I. Jung. 2012. Rainfall runoff modeling efforts for climate change assessment and decision making in the Pacific Northwest. J. Hydrol. 464-465, 233-248. Skaugset, A., C. Surfleet, and J. Amann. 2011. Evaluation of erosion models for predicting forest road erosion. Journal of the Transportation Research Board, No. 2203, Vol. 1, 3-12. Surfleet, C., A. Skaugset, and J. McDonnell. 2010. Uncertainty assessment of forest road modeling using the distributive hydrology soil vegetation model (DHSVM). Can. J. For. Res. 40: 13971409. Beschta, R.L., M. Pyles, A. Skaugset, and C. Surfleet. 2000. Peak flow responses to forest practices in the western cascades of Oregon, USA. Journal of Hydrology 233:102-120.